In 2007 I filed an extensive report on the wines of Albert Bichot following a visit to Bichot’s Long-Depaquit domaine in Chablis and some of the company’s other Burgundy properties. So it was nice to reacquaint myself with a couple of their more recent vintages, including the 2011 Chablis from Domaine Long-Depaquit and, from much further south in the Côte de Beaune, another all-Chardonnay white wine, the 2010 vintage from the village of Saint-Romain. Both of these wines are stocked by Oddbins, but please note as of August 2012 neither is showing on their web site: the Chablis should be listed soon and the Saint-Romain is currently showing as the 2009 vintage, though I have been informed that the 2010 is arriving in stores imminently. 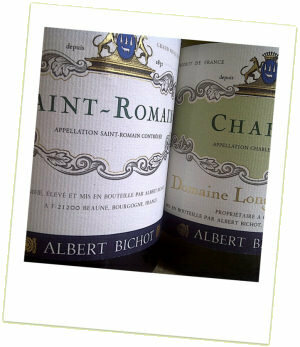 For stockists of all of Albert Bichot’s extensive portfolio, see wine-searcher. This very pale lemony-green Chablis weighs in with a feather-light 12.5% alcohol and has a beautifully clear and pristine nose, with firm green apple and a hint of waxy lemon rind, but all very taut and precise. On the palate there is delightfully fresh, mouth-watering fruit. Citrus and that cool apple for sure, but just hints of greengage even a faint touch of gooseberry, with abundant fruitiness sliced through by the lemon and mineral acidity. Classic Chablis style and lovely indeed. 89-90/100. £13.00, Oddbins. The gently toasty and nutty oak influence is immediately obvious on the nose of this Côte de Beaune Chardonnay, along with a real ripeness of fruit and oatmeally sense of richness. It is much more honeyed and open than the Chablis. On the palate it is delicious I must say: those hazelnut and buttery, toasted crumpet nuances are there, but the ripe and quite fat core of apple fruit comes through powerfully, but then so does a decisive lemony acidity which, along with hints of spice and a full texture, leaves this a very rounded, very impressive white Burgundy at its moderate price. 91/100. £16.75, Oddbins.